The 5th of October. Another day inthe tons of historical days for Serbia. For some, it is the day when the country got rid of the claws of the authoritarian regime, for some it is the day of broken expectations, but some people live the 5th of October as a black day in Serbian history. My family, friends and I have a vivid memory ofthe 5th of October of 10 years ago. I lived through the 90s dreaming of the day when we would erase Slobodan Milošević from the political scene. Him and all that his regime represented and embodied. Together with thousands of other people, I fought so that wars, sanctions and want would end. I marched with students in their demonstrations under rain and snow. 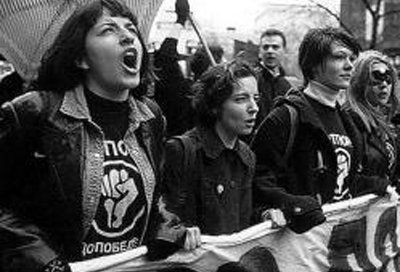 I traveled the whole country with Otpor, appealing for a peaceful change in power. Paradoxically, the 90s were the most beautiful and the most difficult years of my life. Particularly beautiful because I was part of the citizens’ uprising, because I met brave and smart people, and because I was a small part of a great chapter in the history of a different Serbia, a Serbia I still believe in. They were difficult, but we easily forget it,because the lives of all of us were studded with fear, repression, grayness and lack of hope. I proudly remember the 24th of September, election day, when we once and for all said “no” to the 90s with our pencils in hand and with our reason. That was the victory of the people of Serbia. But it was not over. Protests throughout the country followed, a national strike was called, Serbia was paralyzed. Life had stopped. One thing seemed truly important: defending the vote and the elections results. We did not realize it, and we could not,but the citizens’ uprising had ceased, and negotiations to take control and power had begun. Who spoke to whom, who came to agreements with the army and the police so they would not attack citizens in the streets, what was asked in return and what compromises were reached still remains a mystery for us “ordinary” citizens. But under that circumstance, this is not so important. I am not so much trying to understand Serbia’s recent history, as describing a personal memory. I did not even consider spending that autumn somewhere other than Belgrade.I do not regret it at all, it was my decision. My family, my friends and I were in front of the Parliament building not because we believed in the leaders ofthe Democratic Opposition of Serbia (DOS): we were there because we had no choice. I never believed in another political god personified of the opposition, I just wanted that authoritarian regime to be over. This is why the 5th of October is so important to me. What no one can take away from me is the memory of the happiness I felt. Not even all the disappointed people, not even the fault finders, not even the whole opposition leading today. No one and nothing will ever be able to convince me that I could have been happier somewhere else, that October morning. On the 5th of October we were in the streets. Everybody knows what happened. Vojislav Koštunica became President,elections were called and the then DOS won. We were starting to breathe a sigh of relief and hoping for a “better tomorrow”. Ten years later. Maybe you are wondering if this is the SerbiaI fought for. Was it worth it? Yes and no. I would do everything all over again: not once have I ever regretted the choices I made and, with hindsight, I can easily say I would never want to be left out. No, this is not the Serbia I wished for. Everything is slow, everything is late. We struggle unsuccessfully in the whirls of the past. This country is not even the slightest close to being straight, a country where all citizens can feel good. Nationalism is corroding the social fabric, Kosovo is still a sore word and we are not able to hand fugitives over to the Court of The Hague. Europe is far, corruption wild, post-traumatic syndrome more and more obvious, young people have no dreams, parents no time to dedicate to them, investments are scarce. We do not even know who we are or what is our identity. A Prime Minister has been killed, there are no new political élites, the old ones become new, nicer to look at. It is hard, however, to forget and forgive all their sins. It is a bitter pillto swallow. As Dragoljub Žarković, leader writer of the weekly Vreme says, the ghost of weariness hangs over Serbia. Nonetheless, something has changed. I am watching a documentary on B92, on the months preceding the 5th of October. The news reports being cut at the time. It is good that they remind us. Some titles: “There is no bread”,“There is no oil”, “Arrested”, “Beaten”, “Disappeared”, “Killed”, “Sanctions imposed”, “Bombings lasted three months”, “Borders closed”. Fade out. Ten years later, it is not pitch dark, in Serbia. It is dark, yes, but sometimes the sun comes out to warm us. We travel freely. Wages and pensions are low, but regular. We can vote in fraud-free elections. We go forward, slowly and, often because others remind us, we learn “new” concepts that are old for a lot of other countries. There are no wars. We do not resort to weapons if we do not agree with our neighbors or with the world. Not even today do I want to weigh that 5th of October down to see if the positive things are more than the negative ones. I do not see how that could help, even if I am certainly not trying to escape from Serbian reality. And even today, I do not want to be among those complaining about the destiny of this country. I am here, ten years later, in Serbia, even though it is still very far from the one I wished for it to be. It is my choice, as it is my choice to continue to do my best so that Serbia becomes a better place to live in. And still today, I do not believe unconditionally in political leaders and their projects. Is there a better place than Belgrade on the 5th of October 2010? No. Because Belgrade is my city. My battles are here and I decide not to renounce them. Step after step, until we reach that utopian dream called normal Serbia. There is something else that seems important tome, however. I am under the impression that there are far too many “historical days” to celebrate in Serbia, including the 5th of October. This is the last time I am recalling memory. I want to look at the future and I once more want to feel that energy to change what we recognize as not good. I have had enough of myths and legends. Even though they are legends I myself have helped create.